Direct Gulf Front - Complete Remodel 2018 - Penthouse View - Sleeps 6 ! This completely remodeled condo is direct Gulf-front at its best! We just completed a major remodel in Jan. 2018 and our unit features brand new tile throughout, new stainless appliances and quartzite counter-tops, and a classic fresh, open look that will delight you! Our condo is on the top floor and our view is fantastic. Unit 716 is not a "middle stack" unit, so the view is superior ! Located at the ever-popular Holiday Surf and Racquet Club on exclusive Holiday Isle... a peninsula surrounded by the Gulf of Mexico and Destin Harbor... View sugar white sand and the emerald green waters of the Gulf of Mexico right from your own living room and private balcony! You don't have to cross the road to enjoy the surf here. Removed from US Highway 98 traffic, but minutes from restaurants, shopping, boat docks, fishing, golf, and amusements. Walk or jog on Holiday Isle's two and a half miles of sidewalks, or bike through its quiet neighborhood streets. Nothing else in Destin can compare! This one bedroom, one bath, seventh-floor unit sleeps six... with two full size beds in the bedroom and a queen-size sleeper sofa in the living room. The cook will find an open concept fully-equipped kitchen... with a breathtaking view of the Gulf of Mexico! Dining table seats four with two more spots at the breakfast counter. We have a 42" Hi Def TV in the living room and a 32" Hi-Def TV in the bedroom in case you hit a rainy day or want to watch a DVD at night. NOTES: Minimum rental age 25 and is verified at check-in by staff. Our condo does not allow any pets and it is a No Smoking condo. $300.00 Reservation Deposit due at booking, full balance due 30 days before arrival date. Beach chair service is not included with our unit's rental fee, but you typically can rent for $30/day from the beach service vendor, bring your own chairs from home or buy something inexpensive locally at the nearby WalMart or Target. Just outside Holiday Surf's door you can step into our heated pool... or take a few steps across sugar white sand to swim in the beautiful emerald green water of the Gulf of Mexico. Holiday Surf offers two tennis courts and exercise facilities onsite. Opportunities for paddle boarding, kayaking, parasailing, snorkeling, and fishing can be found along the beach too. Holiday Surf & Racquet Club is located a little east of the 'jetties,' where the Gulf of Mexico and Destin Harbor meet, a spot well-known for great snorkeling and diving. And the perfect place for the end of the day... Here you can watch a parade of boats returning from Gulf to harbor as, behind them, the sun sinks into the Gulf of Mexico. Only a few minutes' drive will take you to Destin Harbor... home of Destin's world-class charter fishing fleet, plus sailing excursions, sunset cruises, jet ski and pontoon boat rentals, diving, snorkeling and dolphin watching trips... also, wonderful water-view restaurants and fun dockside bars. Nearby are abundant shopping opportunities... from exclusive boutiques to outlet stores, antiques, and art to sandals and bathing suits. Numerous golf courses and amusement parks are only a short drive away. My name is Mark Lucas and my wife Judy Lucas and I live in Maple Grove, MN. We purchased our condo in 2003 and have been pleased to share it with many Destin vacationers over the years. We have three grown children, and we love to vacation in Destin as often as we can. The beaches in Destin Florida are superior to any other in the continental U.S. and the crystal clear, emerald green water is fantastic to swim in. Our condo is on Holiday Isle which is a very upscale section in Destin and when you travel down Gulf Shore Drive to our condo you will pass by multi-million dollar gulf front homes which are beautifully landscaped. The aesthetic of Holiday Isle is gorgeous, beautifully landscaped and quiet, as it is off the 'main drag' of Destin. Our fantastic direct gulf front condo offers easy access to sugar white sand beach, heated pool, tennis courts, snorkeling, sea kayaking and other water & beach activities. Our condo is located close to the Destin Harbor district, where you can dine overlooking the gulf & harbor, rent a pontoon boat or jet ski, go charter fishing or take a dolphin cruise. Full size bathroom with tub. 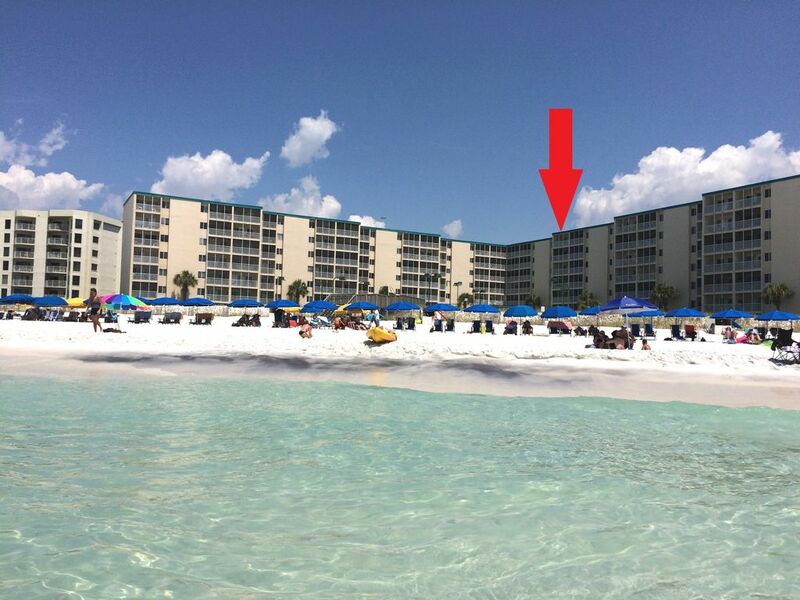 Our building is DIRECT Gulf front, no streets to cross to get to the beach! Shared laundry facilities on 4th and 6th floors. Holiday Surf & Racquet Club is a gated community for extra security. There is a well equipped fitness center onsite for our guest's complimentary use - treadmills, ellipticals, weight machines, etc. Two centrally located elevators right off the lobby. Our condo features a Keurig machine and a full size coffee maker for your morning cup! New 4 place dining set plus two bar stool seats at the kitchen counter. Four comfortable high top chairs and table for outdoor dining. Nothing better than a cup of coffee or a beer overlooking the Gulf! Rent a kayak from the onsite beach service guys. DVD (2), Free High Speed Secure Wireless Access, Washer & Dryer (shared), Tennis Courts, Men's & Women's separate fitness equipment rooms, BBQ Grills (shared). Minimum rental age 25, No Pets, and No Smoking please. The condo complex checks guest identification at check in to verify guest age 25 restriction is met. Awesome place! The condo was very up to date, clean and comfortable. Great view of the beach. Definitely would go back. Thank you so much for renting from us - we really appreciate your rental business! Judy and I are very pleased you enjoyed your stay and we look forward to having you stay at our place again very soon ! Unit 716 is a great condo. The views are spectacular. We really enjoyed our stay. We will surely be back next year! Great condo, immaculate and recently renovated. We had a great vacation staying in this beautiful, recently renovated condo. The location is perfect, right on the beach and close to restaurants and shopping. The view from the condo is fantastic. We especially enjoyed sitting on the balcony watching dolphins. The condo itself exceeded our expectations. It had all of the amenities we needed and Mark and Judy are wonderful hosts. Thank you so much for renting from us - we really appreciate your rental business! Judy and I are very pleased you enjoyed your stay and we look forward to having you stay at our place again soon ! We really enjoyed the place! Very comfortable. Thank you! Thank you so much for renting from us - we really appreciate your rental business! Judy and I are very pleased you enjoyed your stay and we look forward to having you stay at our place again next year ! The condo unit was very nice updated decor with beach colors. The Lucas family were very nice. Condo very clean and nice. Good views of the beach. Unit very comfortable for a family of 4. Cancellation policy - If you cancel at least one month prior to your arrival date, you will receive a full refund of your reservation deposit. If you want to cancel after that point your reservation deposit will be forfeited. We typically only rent our unit on a weekly basis. The changeover day on Saturdays, except during the off season/snowbird months of November - February. Snowbird rental must rent for two months - renter must rent for the entire period January and February. The minimum rental age of 25 is strictly enforced by the condo management and will be verified by the onsite Homeowner Association rental agency representatives when you get your gate code and parking pass upon your arrival.